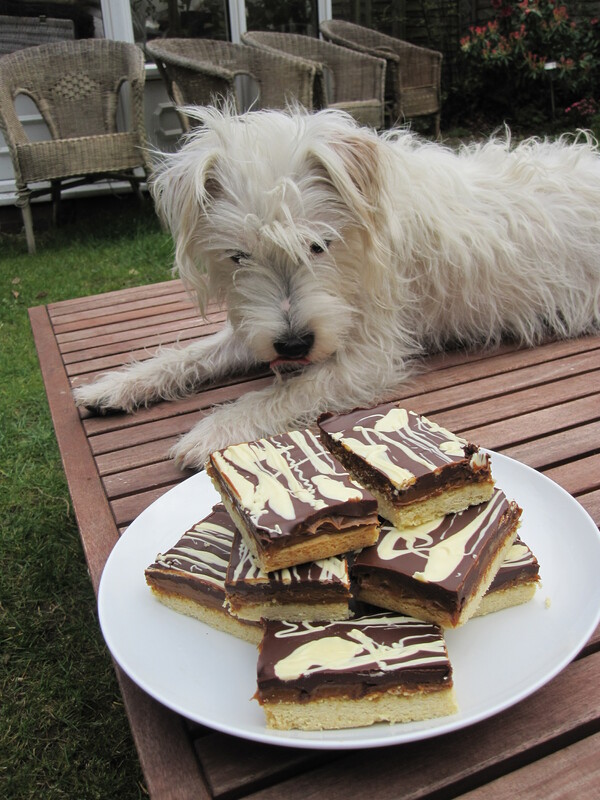 I’m calling this recipe Caramel Shortbread because it is not the Millionaire’s Shortbread I set out to create. I messed up the caramel layer and ended up with praline instead (and delicious it is too). But I didn’t have any more cream to make another batch so I grabbed a tin of condensed milk caramel (submerge your tins in boiling water for 12 hours in the slow cooker on low) and slapped that over the shortbread. I really, really should have waited and gone out to buy more cream today but I didn’t. As such I’m afraid this is so sweet as to be nearly inedible to me. I’m eating each slice with a banana to cut it down a bit, so essentially it has become a banoffee slice. Give the recipe below a go, it should produce caramel but go easy on it! One split second and you have delicious praline instead… but at least you can still eat it! If not, well, a tin of condensed milk caramel does the job… after a fashion. I know exactly what I am after. I want the caramel shortbread from Starbucks, because if my latte habit weren’t bad enough I’m now forking out for one of those a day too! 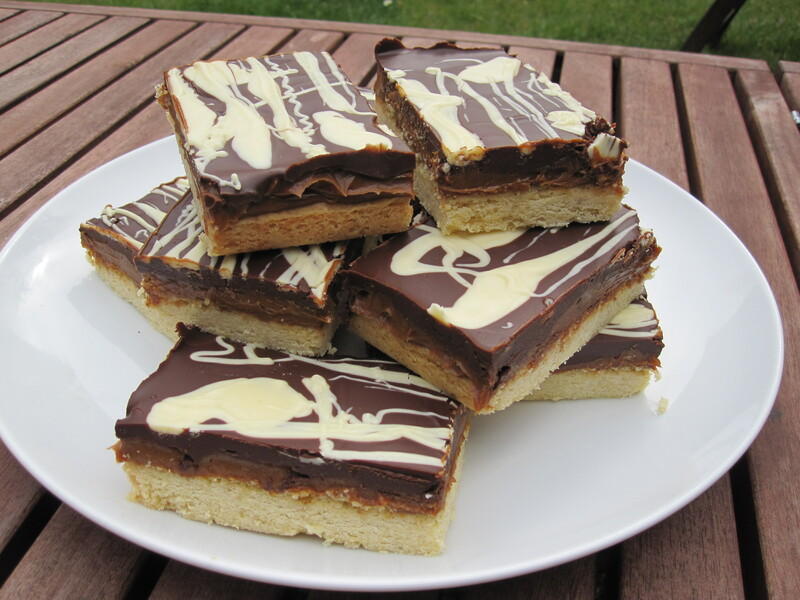 I want caramel that moves but still has bite to it, shortbread that crunches but doesn’t crumble and a nice salty edge to it all and a nice, crisp snap of chocolate on top… this recipe isn’t it. Not by a long shot. But it is quite nice in its own right… once you come out of the sugar coma. If you have any children you would like to sugar up before sending back to their parents (nieces, nephews, cousins, grandchildren etc.) then this recipe would work wonders I’m sure! – First, line a brownie tin (I think mine is 18cmx28cm or something stupid like that) with baking paper. – Put all of the ingredients for the shortbread in a food processor. Blend until it comes together to for a dough. – Gather the dough together with your hands and press into the tin to form a smooth, even layer. – Chill in the fridge for 20 minutes. – Heat the oven to gas mark 3 and then bake for 35 minutes. – Remove from the oven and set aside. – In a heavy bottomed pan melt the sugar, butter and cream together then bring to a boil and boil until it changes colour. – Test small drops of it by dropping it into a glass of cold water. The caramel should form a ball but still be soft. If it’s hard then you’ve gone too far as I did. This is the tricky bit, as soon as it changes colour, start testing! – Once you have soft caramel immediately remove from the heat and add a pinch of salt and stir thoroughly. 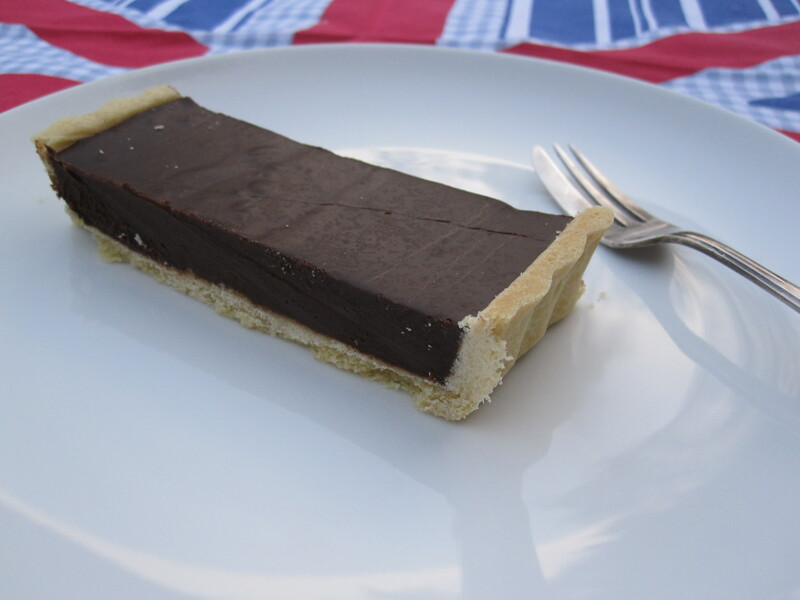 – Pour this over the shortbread layer and set aside to cool at room temperature. – Once totally cool melt your dark chocolate and butter together either in the microwave (short bursts until melted) or in a bowl over a pan of boiling water. – Pour the melted chocolate over the caramel layer and smooth out. – Melt the white chocolate, I find the microwave is easiest with white chocolate, just give it 30 second bursts until it’s melted, stirring between times. 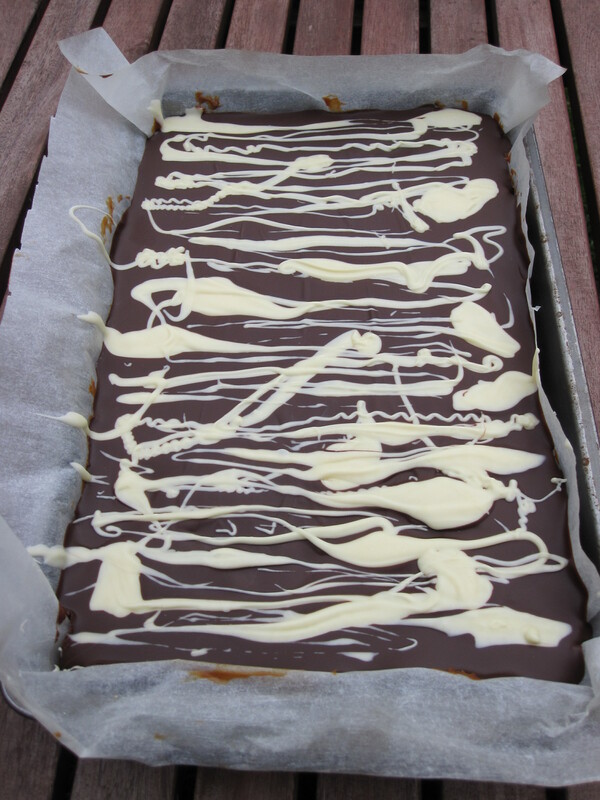 – Drizzle the white chocolate over the dark in whatever pattern pleases you. – Tap the whole tray firmly against the table/worksurface/whatever to settle the two chocolates together and give a smooth surface. – Leave to cool at room temperature until the chocolates are hard again. 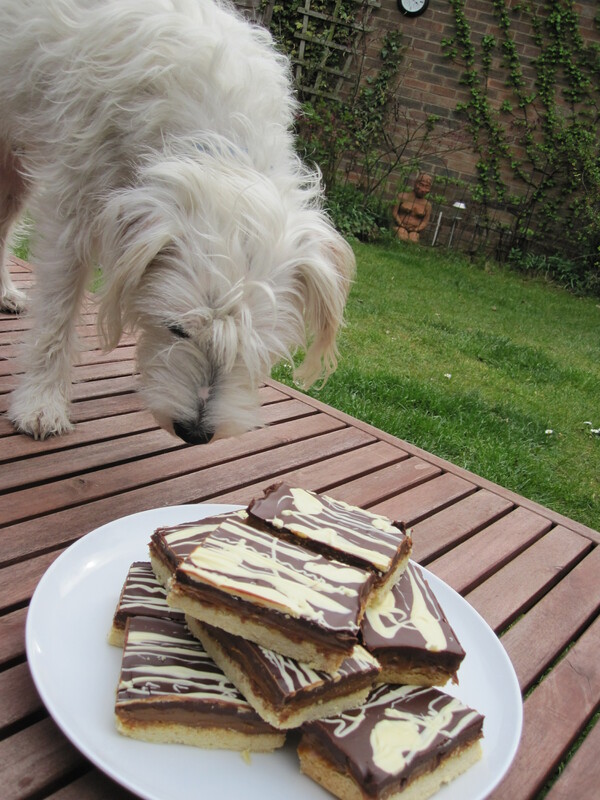 – Lift out of the tin, remove the paper, slice into 12 and enjoy… with a banana if the caramel incident is repeated! Having seen variations of this recipe in about half a dozen places recently I finally submitted to fate and decided to whip up a quick brunch of Oeufs en Cocotte or, if you prefer, Baked Eggs. It was a lovely day, summer is starting to approach, so we had our brunch sitting out at the table in the garden. I love eating outdoors, when you’re able to sit outside for long enough to eat something without freezing important parts of your anatomy off then summer is nearly here and if you know me then you already know that I love summer! These are so simple to throw together and for what they are, rather an impressive little dish. They take almost no effort but they taste and look great, which makes them a sure fire winner in my book. Next time I have someone staying over I’m sure these will be appearing for breakfast. If you want a little more in your breakfast you could easily fry some bacon and add that into the bottom of the ramekin for an added bit of interest. I, however, think that when you have good, fresh, free range, local eggs there’s no need to make things more interesting, these eggs are going to taste great no matter what you do with them. Serves 1, simply multiply by however many people you have to serve. – Heat the oven to gas mark 6. Well grease a ramekin dish with butter. 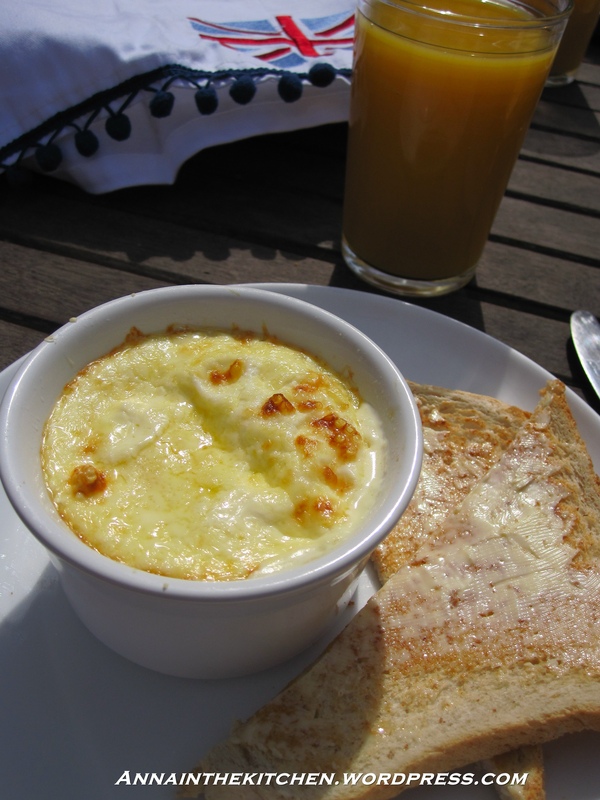 – Sprinkle about 2 tbsp grated cheese in the bottom of the ramekin. – Crack 2 eggs on top. – Spoon the cream on top of the eggs so there’s a layer over the top. – Place in the oven on a baking tray (makes it easier to lift in and out) and bake for 8-15 minutes depending on how big your eggs are and how cooked you like them. – Serve with hot slices of toast smeared with butter to dip in. * I have rather large ramekins, if yours are small then one egg may fill them, simply adjust the cooking time a little. ** I don’t like pepper but do like a tiny bit of salt, consult your guests or simply prepare them without and have salt and pepper on the table. I usually make oven risotto because it’s just easier. However, tonight I didn’t want a tomato based one. 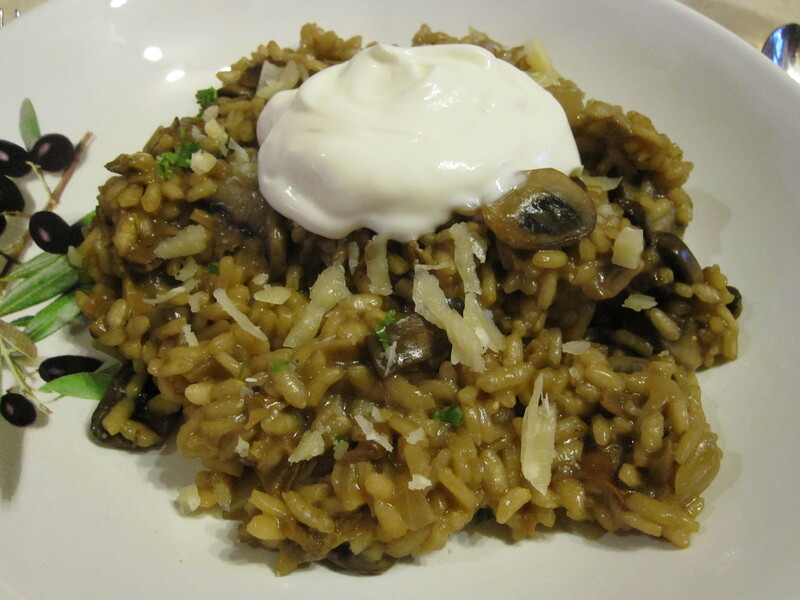 Sure I could have simply adapred the oven risotto recipe to make a mushroom one but I wanted to have a go at doing a ‘proper’ risotto. Indeed, tonight I endured a lot of heckling from my parents because I insisted on doing it the ‘proper’ way and adding the liquid gradually. Apparently it can work just as well if you put all of the stock in at once and just leave it. But I was in charge tonight damnit! I was doing it properly! – First soak the porcini mushrooms in a litre jug of boiling water for at least 20 minutes. – Fish out the mushrooms and chop roughly. Reserve the mushroom stock. – Heat a little oil in a large pan/casserole. – Add the onion and garlic along with 1/2 tsp salt and fry gently until soft. 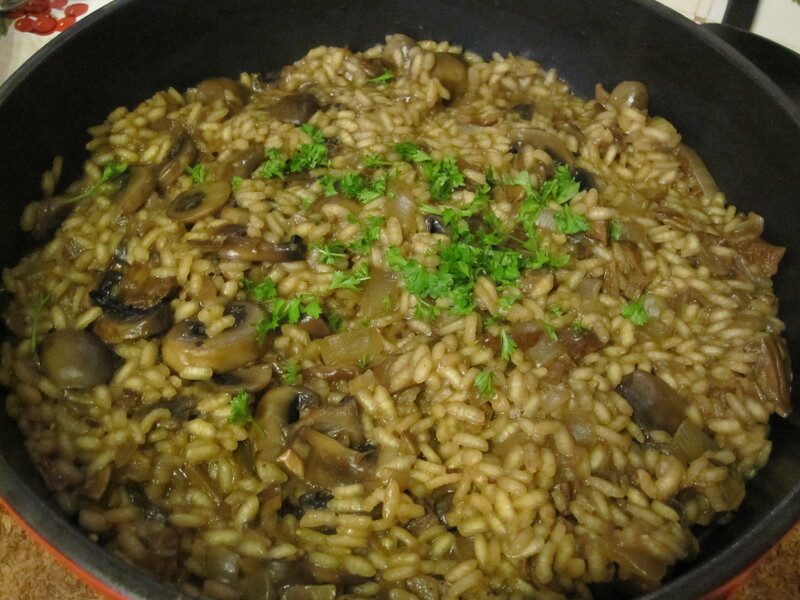 – Add the chestnut and porcini mushrooms and gently fry until the mushrooms soften. – Add the rice and stir well, cook for 1 minute. – Add the wine and cook, stirring to mix, until all of the wine is absorbed. – Add about 1/4 of the stock. – Repeat until all of the stock is absorbed. Don’t pour the last few tbsp of stock into the pan as it will be gritty. – Turn off the heat and cover the pan with a lid and leave it to stand for a few minutes to absorb the remaining liquid. – To serve, sprinkle with parsley then serve with grated parmesan and creme fraiche. * This will take around 30 minutes if not a little longer. All in all I’d say start this recipe about 1 hour before you want to eat. It is my mum’s birthday today. As a result I was up until 1:30am making her cake. She does this every year, the rest of us conveniently schedule something that will keep us out and the kitchen clear the day or two before our birthdays but with mum I have to wait until she goes to bed and then get cracking! I’m used to this, however, and I had sort of planned for it. Cakes always take twice as long to cool when you’re in a hurry though, don’t they? She likes lemon so this year I thought I would do a lemon cake. She had also been talking about, although never actually baking, a lemon meringue cake filled with lemon curd and marscapone. I knew I wouldn’t have time to be playing about with meringue but I cheerfully borrowed the lemon curd and marscapone filling. I’m very glad I did. 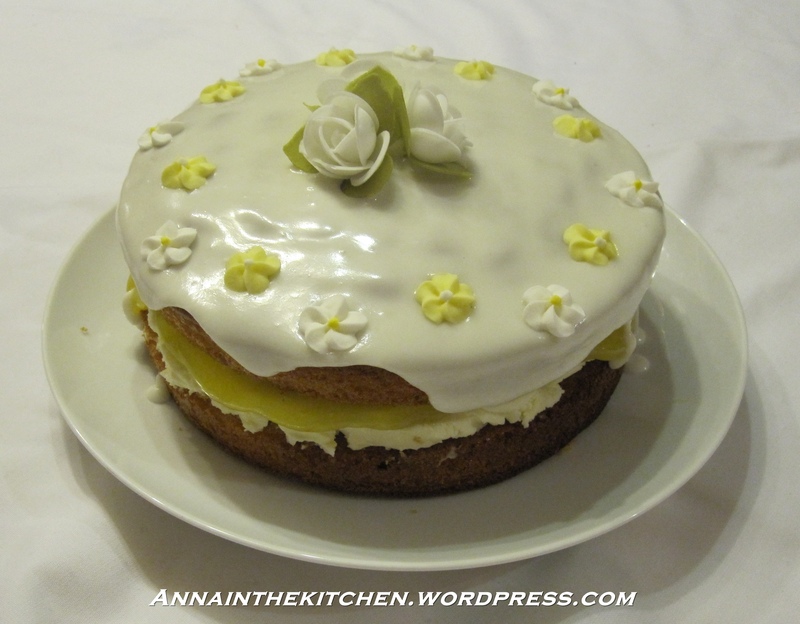 The resulting cake was light, lemony and bright. Everything I had hoped for. I only discovered lemon curd recently but I love it! – Heat the oven to gas mark 4 and grease (and line if necessary) 2 sandwich tins. – Cream together the butter and sugar in a large mixing bowl until light and fluffy. – Add the lemon zest. – Gradually add the eggs a little at a time and beat well between additions. – Add the lemon juice and stir through then add the milk and mix well to combine into a smooth mixture. – Place in the oven, on the same shelf if at all possible, and bake for 30-35 minutes, checking after 20 and swapping tins around. – Test with a skewer to see if it’s cooked, if the skewer comes out clean then it’s ready. – Turn out and leave to cool completely on wire racks. – Pick which will be the top and which the bottom. – Place the bottom on your chosen serving plate. – In a small bowl mix together the marscapone and icing sugar. – Spread the marscapone evenly over the cake. – Spoon lemon curd over the marscapone layer, using the back of the spoon to swirl it evenly over the marscapone. – Add the top cake and gently press down to secure it. – Carefully spoon/pour the icing into the centre of the top of the cake and try to guide it out towards the edges smoothly with the back of the spoon. It will drip off the edges. This is life. – While the icing is still wet add your decorations of choice then leave to set before serving. A few weeks ago I was browsing in the Chinese supermarket and came across a bag full of rose buds in the tea section. Now I’ve had flower teas before that a Japanese friend brought back from a business trip to China but I’d never had rose tea. To be honest my mind didn’t come round to making tea with them for a while and I’m still not convinced but my first thought was “OMG, those would look adorable on cupcakes!” I was really just waiting for the opprotunity, which presented itself last night. I thought of using rose water in the cake part but I bought a bottle and one whiff put me off that plan. Roses are for looking pretty and smelling, not tasting! I may yet come around and find a use for that rose water but I’m not holding my breath. 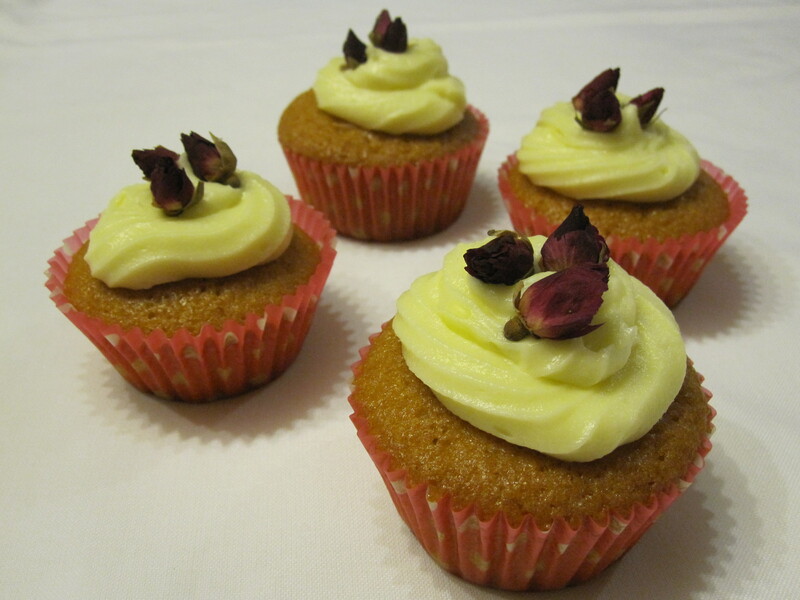 I had been thinking of making a white chocolate buttercream to go with the imagined rose cake. I have no idea why as I didn’t know what rose water tasted like but in my head they went well together. As it was it was absolutely delicious with vanilla cake. I’m afraid the photo doesn’t really do them justice for how cute they are as these are the last 4 in existence… we sort of ate the rest. – Heat the oven to gas mark 4 and line 2 12 hole muffin tins with small sized muffin liners. – Cream together the butter and the sugar in a large mixing bowl. – Beat the eggs and vanilla together in a jug. – Gradually add the egg a splash at a time, mixing well between additions. – Fold in the flour until totally combined. – Divide the mixture equally between the paper cases, filling about half full. – Bake for 20 minutes, either swapping the trays over after 10 minutes or moving the bottom tray up for an extra 5 minutes at the end. – Remove from the tins and leave to cool completely. – Break the chocolate into small chunks and place in a small bowl over a pan of boiling water. Leave it to melt. Then remove from the heat and allow to cool slightly. – In a medium sized mixing bowl cream together the butter and icing sugar until there are no lumps left. – Add the melted chocolate to the bowl and mix well. If the mixture seems a little too soft then just add another spoon of icing sugar and mix it in. – Pipe the icing onto the cakes amd decorate as you wish! For ages I have wanted a regtangular flan tin. I just like the aesthetics of them. The only problem was that they are expensive! But I’m so glad I managed to find one within my price range. I saw this recipe in one of the sunday supplements and immediately re-launched my hunt. Within a week I had my tin and I had my tart! This is a very nice tart but I have to admit it didn’t immediately jump up and grab me. It’s chocolate. Sure, the Cointreau adds a nice little touch but not enough for me to lift it into stellar territory. I’m not very into pastry either so that didn’t do it for me. Pastry is basically for holding the filling together, past that, well, I find it hard to get enthusiastic. I do have to say that it keeps incredibly well. In fact I would say that the flavours really benefit from a day or two standing to meld. So an aesthetically pleasing make ahead dessert. – In a jug whisk together the egg, water, vanilla and icing sugar. – In a medium bowl sift together the flour and salt. – Rub the butter into the flour. – Once the dough has come together form it into a flat disc and chill it in the fridge for at least 1 hour. – Roll out the dough on a lightly floured worksurface to a thickness of a £1 coin. – Line a 23cm loose bottomed round tart tin or a 34cmx10cm rectangular tin with the pastry leaving an overhang of about 1cm. – Patch any holes and prick the base all over with a fork. 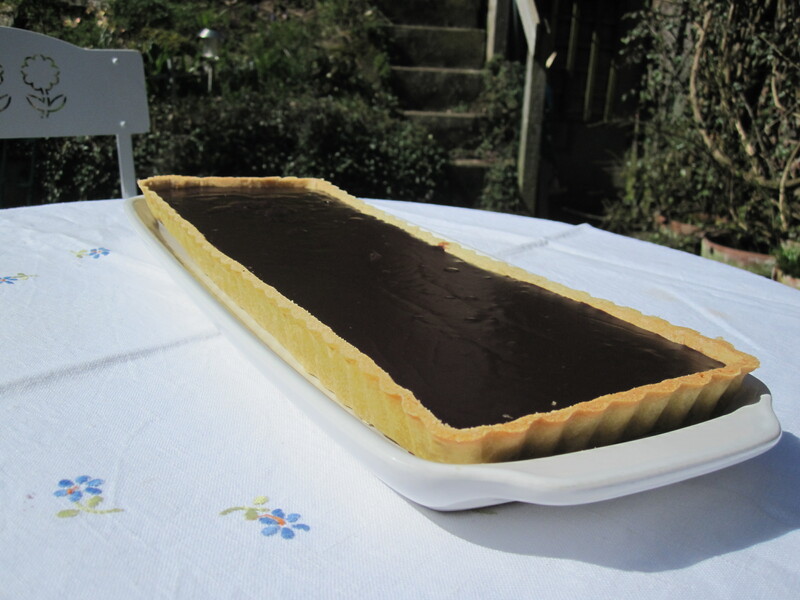 – Line the tart with foil and put in the freezer for 20 minutes – half an hour. – Heat the oven to gas mark 5 and put in a baking sheet to heat too. – Fill the pastry shell with baking beans and bake for 15 minutes. – Carefully remove the beans and very gently remove the foil. – Return to the oven for another 10-15 minutes until the bottom is golden brown. It won’t go back in the oven so make sure the pastry is cooked. – Once cooked trim the overhang off the pastry shell with a sharp knife and allow to cool. – Put the cream, sugar and Cointreau in a pan and bring to a simmer. – Turn the heat down low and add the chocolate. – Stir until the chocolate has melted and the mixture is smooth and glossy. – Pour the chocolate into the pastry shell and smooth or swirl the top. – Allow to stand at room temperature for several hours until set. Anyway, illness aside, I had a poke around on the interweb and came across a recipe by Delia that I thought sounded promising. I’m sorry Delia, but you’re fired! If I had actually followed the recipe given my pastry would have collapsed, my filling would have been almost non-existant and it wouldn’t have been cooked through! I’m very glad that I can actually cook because if I didn’t know what I was doing and had trusted to the guidance of Delia then dinner would have been a disaster! As it was I managed to produce quite a nice tarte. I’ll be doing this again as a) the photography here was just terrible and b) I can make this so much better than it was. Make no mistake, this recipe is good but I know I can make it so much better! – First, make your pastry. In a medium sized bowl mix together the flours, salt and mustard powder. – Cut up the butter into chunks then rub into the flour with your fingers until the mixture looks like breadcrumbs. – Add the cheese and mix well to distribute it evenly. – Sprinkle 1 tbsp the water evenly over the mixture, then mix together with your hand, adding more water gradually until the dough just comes together. – Form the dough into a flat disc and wrap in clingfilm. – Chill for 30 minutes in the fridge. – Slice the onions into long, thin strips. – Melt the butter in a very large pan, the larger the bottom of the pan the better but to begin with you’ll need deep sides too. – Add the onions to the butter and stir until lightly coated. – Keep the onions over a medium heat for about 30 minutes. Stir frequently to stop them from catching on the bottom. – Once the onions are well reduced and a deep golden brown turn the heat off. – Preheat the oven to gas mark 5. Place a baking tray on a shelf in the middle. – Grease a deep, loose-bottomed, 20cm cake or flan tin. – Roll out your pastry on a lightly floured worksurface. You want to keep it as round in shape as possible so go gently so you’re more in control. – When the pastry is about 2 mm thick then pick it up, by draping it over the rolling pin, and gently lay it over the prepared tin. – Using your fingers, very gently ease the pastry into the tin, pressing any pleats or overlaps down to create a smooth pastry crust with no bubbles. – Prick the base of the pastry lightly with a fork. – Place on the hot baking tray in the centre of the oven for 20 minutes. – Remove from the oven and carefully remove the beans and foil, you need to be careful not to make any holes in the pastry. – Brush the inside of the pastry with a little of the beaten egg. – Return to the oven for another 5 minutes. – Mix together the cream and remaining beaten egg. 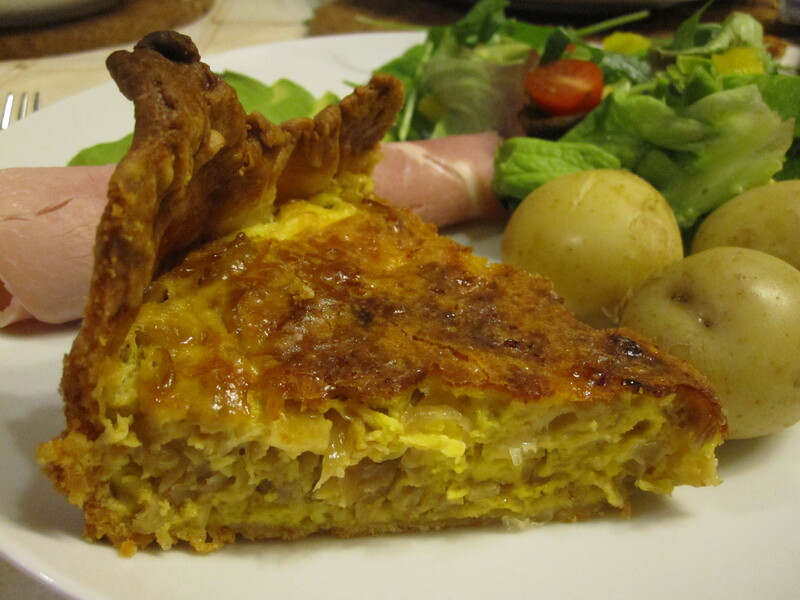 – Take out the pastry crust again and add the cooked onions. – Spread out evenly over the bottom of the tarte. – Pour over the cream/egg mix and mix a little with the onion to ensure even coverage. – Sprinkle over the grated cheese. – Return to the oven and turn up the temperature to gas mark 6. Cook for 45 minutes until the egg is set and the top goes a deep brown. – Remove from the oven when cooked, run a knife around the edge and gently remove from the tin and place on a serving plate. – Serve as you wish. I went for salad, cold meats and new potatoes but it would make an excellent picnic food if you wanted to eat it cold. * Next time I will use more onions, at least 800g if not 850g. I will also use at least 6 eggs and probably more cream too to create a deeper, denser filling. ** Baking beans don’t have to be the expensive ceramic ones some cookware stores will flog you. And for this recipe you need rather a lot. We use plain old dried beans. You simply use them until they cremate themselves, which will take over 30 years. They will get darker and drier over time but that’s ok. They’re cheap and easy to replace.